EDIT: If you want to receive the coupon code to receive a FREE MONTH of Elysium Basis, which is only available to friends and family, please contact me to request the link, and I will email it to you as soon as I can. Basis has changed the discount…it is no longer $10 off the first month. They are now offering a FREE month with any prepaid subscription of 6 months or 1 year. The current cost of a six month subscription is $45, which is a 25% discount off the $60 price for a single month. Combined with the free month, that brings the monthly cost down to $38.57, a significant savings. 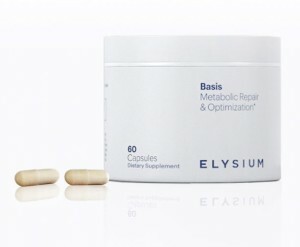 I recently saw an article about BASIS by Elysium Health. The gist of the article is that one of the world’s leading experts on aging, MIT biology professor Lenny Guarente, has banded together with some Silicon Valley entrepreneurs to bring to market a product that he believes has a great deal of potential to slow the process of aging in the human body. The process of taking his drug through human trials as part of the FDA approval would take years and be very expensive, so he has chosen to get it to market by an alternate method–by packaging it as a supplement rather than as a drug, because the supplement market is much less regulated. Instead of the actual drug, the supplement he is selling contains a precursor of the drug that allows your own body to manufacture the ultimately desired compound, which is NAD+, or nicotinamide adenine dinucleotide. NAD+ occurs naturally in the body, but the amount of NAD+ drops steadily as people age, and an elderly person has approximately half the amount of NAD+ that would be present in a younger person’s body. The decline is similar in mice. In a study with mice, relatively elderly mice (two years old) were given NAD+, and in only one week, the tissues in their bodies appeared to be younger, similar to an adult six-month old mouse in its prime. In order to be considered a supplement, the product has to be a naturally-occurring. 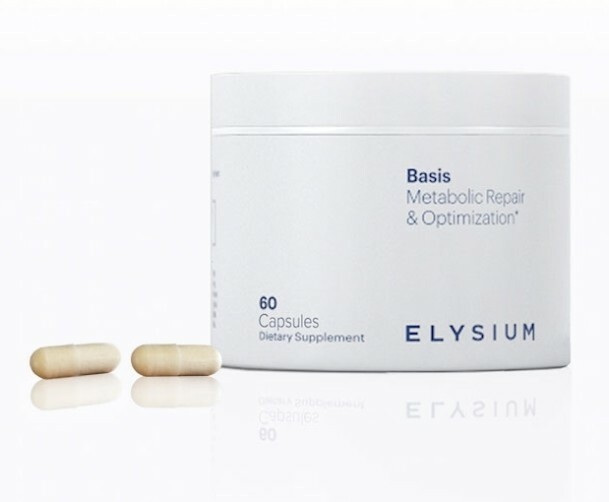 The people at Elysium have chosen to include only two ingredients in their product: nicotinamide riboside 250mg (the precursor that the body will use to make its own supply of NAD+), and pterostilbene 50mg, which is a naturally-occurring polyphenol that can be found in blueberries (and which is similar to resveratrol, but which Dr. Guarente believes has the potential to be much more effective than Resveratrol at combating the effects of aging). I was immediately interested in this product, because it does seem to have an excellent pedigree, and to be backed up with hard science, unlike many other products on the supplement market. I decided to look into the two components to see if I could beat the product’s $50 per month cost (the cost if you subscribe using the pay-as-you-go method–the product can be less expensive if you pay for a six month supply or a full year’s supply up front). What I found is that on Amazon, nicotinamide riboside costs almost as much as Elysium’s BASIS product, and when you add the cost of pterostilbene, it actually exceeds the cost of BASIS. Add to that the fact that the people at Elysium have stated that they use state-of-the-art production methods, that their product is pharmaceutical-grade, and that they plan to do their own regular safety and quality-control testing, and ordering directly from the folks at Elysium (which is the only way to get the product–they are not making it available through any other channels) became an easy choice to make. When an eminent scientist puts his reputation on the line by backing a product, that carries some weight with me. I was not able to find a working coupon code to use, so I signed up for the full $50 per month cost (shipping is free), but I was able to register on the Elysium website and get a discount code to share. It used to get you $10 off your first purchase, but the terms of the offer have now changed. It currently gets you a free month with any prepaid subscription. I’m happy to be able to share the free month with friends and family. You can simply contact me to ask for it and I will send you the link as soon as I am able (please note: the discount will not show in the shopping cart until AFTER you have created an account using your email, address, etc.). Will the product work? I can’t say for sure, not only because I haven’t received my first shipment yet, but because I’m not sure this is going to be the kind of thing that is actually noticeable anyway. How would I be able to tell if my cells are feeling any younger? In a way, I think it’s probably the kind of thing that you will just have to take on faith. But I have seen some reports that people have felt more energy after taking the product, including in that Fast Company Exist article that I linked to back at the top. If I feel more energetic, I’ll definitely consider that an excellent side benefit! Curious how you’re feeling on Basis after using it a few months. I’m considering trying it (and I’ll use your code) but haven’t spoken to anyone who’s actually used the product. Thanks. Andy, did you order and try it yet?